Weatherproof performance makes it durable enough. The ability to create a scene with snow fluttering. Outdoor, indoor dual use ,brings you a different feeling. You can use the remote control to control the lights. It is an indispensable atmosphere for Christmas and various festivals. 【WATERPROOF FOR OUTDOOR】Both light and plug are waterproof with rating of IP65(light) and IP44(plug), enabling you to place it outdoor without worrying about rainy or wet weather. But please DO NOT put the light underwater or soak the light in heavy rain. 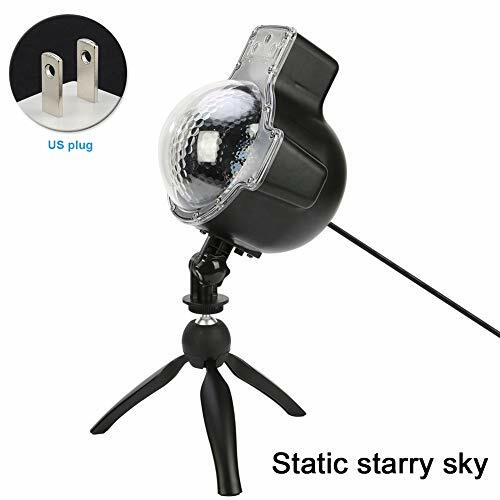 With the waterproof safeguard, it is great for decorating your garden, house, fence, bush, tree, etc, making an outstanding light show among your neighborhoods. 【FAIRY SNOW FALLING EFFECT】With a great many of rotating white spots, the pattern looks like snow flurries falling down from the dark sky. With single button, you are able to control the snow falling speed or make the fairy white snow dots spot at your house. It is easy to create romantic night light display especially in wedding, Christmas, and other festivals or occasions. 【MULTIPLE MOUNTED WAYS】The LED white snow falling light includes necessary tools for you to install it. It is an indispensable atmosphere for Christmas and various festivals. You can use the remote control to control the lights. 【Creative】The ability to create a scene with snow fluttering. Weatherproof performance makes it durable enough. Outdoor, indoor dual use ,brings you a different feeling. 【Color】Static gypsophila, dynamic gypsophila, dynamic multiple pattern.